© Square Enix 03/07/2005 - 25/12/2005 -- ¥? I do not know if this could be considered an official cameo, as the this the anime is not affiliated with Konami, but Pani Poni Dash! has two references to Gradius. "MomotsukiChou News Extra. Language from ancient civilization deciphered. Deciphered letters are (Up) (Up) (Down) (Down) (Left) (Right) (Left) (Right) B A B A. However, according to Professor Tokimemo who heads the task, the letters are incomplete and will result in a big explosion. Further deciphering is being conducted." The other was a short scene in which a bus with four Options trailing behind it fight a cat imitating a Big Core, which promptly blows it away. 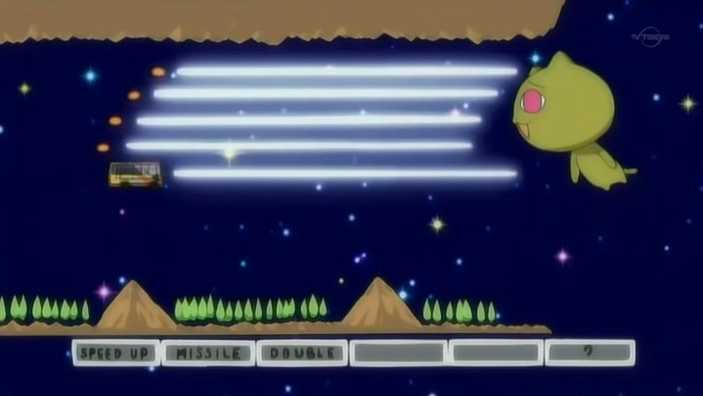 Later in the same episode, Ichijou, one of the characters, is seen holding a power up capsule with three options floating around her and sheilds above her head.